In our experience, having shared clarity of purpose becomes the anchor for everything else in your workshop: the session design, your participant group, the content you feed into your session and the experience you create for your session. Your purpose becomes the means of 'course-correcting' and evaluating the outcome of your session. But what do we mean by 'purpose' and how do you go about defining it? What will be different as a result of your workshop? How and where will you have made progress? A test of whether or not you've correctly written an outcome is if you've used a 'change' adjective e.g. 'more', 'greater', 'increased', 'stronger'. An example of an outcome might be 'We will have greater shared understanding of the opportunities and challenges we face for our 10 year roadmap'. An output will generally map to at least one outcome. It specifies the actual things you will produce and deliver from your session. An output is an object, something you can point to or hold. An example of an output might be 'a draft strategy document' or 'a model of our 5 year strategic roadmap'. Where more focussed collaboration is needed - as opposed to a more free-ranging exploration of topics and ideas - known boundaries need to be specified. My first facilitation mentor always said: "Don't give people a blank piece of paper if there is no blank piece of paper'. I think people appreciate understanding the space in which they can be create, and the topics that are out-of-bounds. Boundaries' can typically be described as scope, givens and design principles. All three are closely related. Most people will understand 'scope' - what topics are 'in-scope' and what topics are 'out-of-scope' for the purposes of the collaboration? On the other hand, there is perhaps less common shared understanding around the term 'givens'. For us, this refers to decisions and current state that are to be stated and acknowledged but are not open to change. Design principles are especially useful when the collaboration involves designing a solution that addresses a real need. Design principles are statements which constrain the range of possible solutions. Examples of design principles might be: 'Any solution needs to adhere to our existing technology policy', or 'The needs of our global stakeholder community should always come first'. 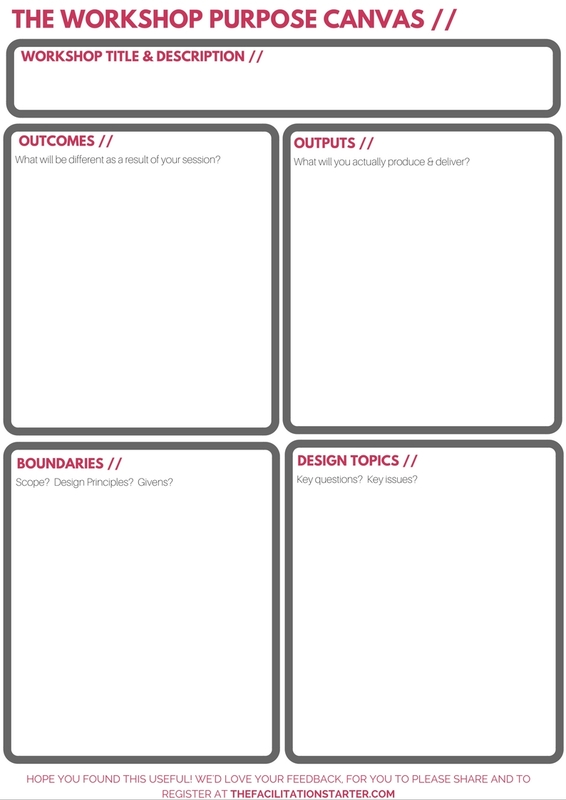 What are the key design questions that your workshop must respond to overall? They reflect the outcome and intent of the session. There's no 'right number' of questions although I find I usually end up with around half a dozen. Take time to really get to the heart of why your workshop needs to be run and what success looks like. We've defined each of the four elements of purpose but how do you go about working with your client to define shared purpose? It takes more than one sitting to define the purpose. You'll typically need to have a few iterations of the purpose statement with the client. Each time testing the statement and becoming more precise with the wording and the intent it conveys. Don't start by asking about each element of purpose directly, in particular about boundaries. Better to follow your curiosity and open up the conversation space with your client by asking open ended questions which explore the rationale for the session. A question I like to ask is: "What needs to be different after this session?". For me, this question helps gets to the heart of the outcomes for the session. As we talked about in this post, the metaphor of a doctor diagnosing a patient is instructive when scoping and defining the purpose of your session. We'd love to hear your own experiences of defining session purpose and especially if you found this post useful. As always feel free to get in touch with any questions. Having trouble defining the purpose of your session? Register today and lets find time to chat.